This Message could do nothing but bring the hearts of all the pilgrims together, in praise and worship, to feel in their spirit that they are one family; all children of God are truly one in Christ, belonging together to eternal life in God’s Kingdom. 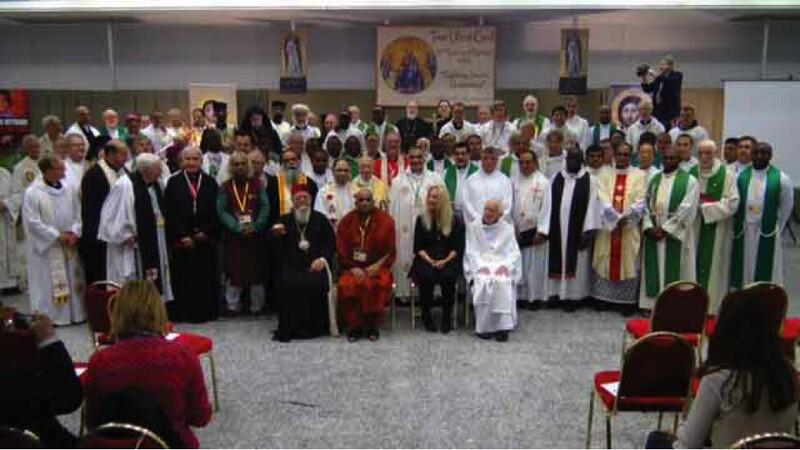 Some who attended this pilgrimage came from afar, altogether from 65 different countries. 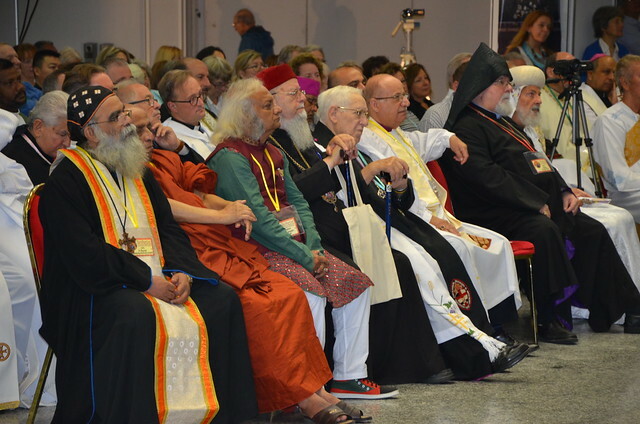 This multi-national gathering alone shows how True Life in God has spread around the world. It can only be God who could extend His Works in such a magnified way. The clergy, along with the lay people were from 15 different Christian denominations. 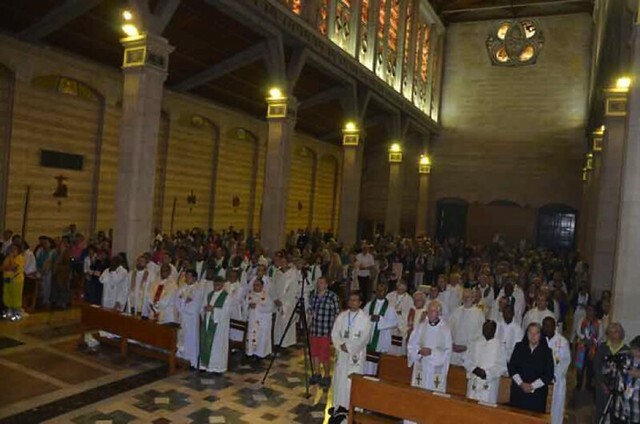 From the 700 people gathered, the clergy alone were 104. There were Anglicans, Armenian Orthodox, Copts, Ethiopian Catholics and Ethiopian Orthodox, one Evangelical, Greek Orthodox, Lutherans, Maronites, Melkite Catholics, Roman Catholics, Romanian Orthodox, Syrian Malankaras, and members from the Delhi Orthodox Church; praise be the Lord! 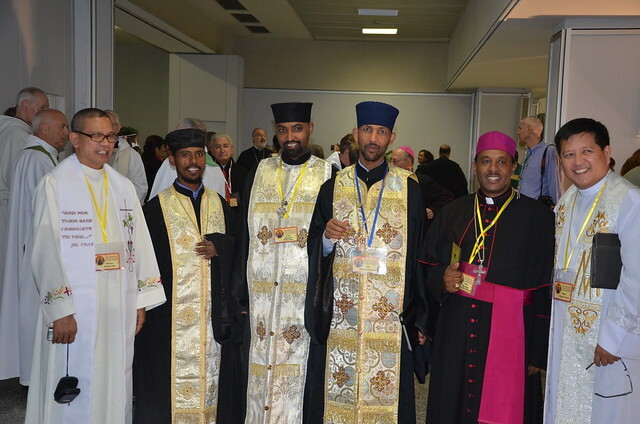 Here are Ethiopian Greek Orthodox clergy with Bishop Markos Gebremedhin Woldesenbet along with Fr. Nestor Caber. At the far right is Vincentian priest Fr. Rolando Tuazon. For 12 years now, there has been an interfaith presence from Bangladesh at our pilgrimages. Faithfully and unfailingly, the presence of the Venerable Mahathero Suddhananda was escorted by two of his loyal Buddhists. Their speeches express peace and harmony for the whole world and the Buddist monks are grateful that our Churches are as well seeking harmony between us and peace in the world. The Venerable, upon seeing Vassula’s efforts of so many years for promoting peace, reconciliation and Unity around the world, had shown his appreciation by inviting her over to their Monastery in Bangladesh, Dhaka, three times on three different occasions to offer her the gold medal award. One of these times they honoured her to receive the gold medal award by the Prime Minister Sheikh Hasina who was invited in their function. In spite of so many endless and frenetic persecutions of certain people that True Life in God inevitably has been experiencing for 29 years, the Voice of Christ cannot be hushed down and will never be buried. The tide of truth continues to gather momentum, as the battle for souls rages ever fiercer and ever more tenacious, and this net which Christ casts in our times must haul in its catch. We must not forget what Jesus was asking Vassula in His Messages; significant: ‘be My net…’ He said to her. This Message does not exclude the rest of us; Jesus is calling each one of us to be His net. Yes, a net we should be, to catch indifferent souls, lost souls, desperate souls and bring them to Christ’s Mercy and Love so that they too may be healed, consoled and discover in their life the meaning of: the Way, the Truth and the Life. Not only do the pilgrims each time grow in numbers, they also always take a step forward towards Unity and a clearer understanding of what sort of Unity is asked from us by Jesus. This is the purpose of our pilgrimages. Every time we meet, we could hear a louder, more persistent and more urgent call for Unity from Christ. After all, one can ask, what is the reason, and what is the purpose that Christ is so decisively gathering so many of his shepherds and us as lay from among so many nations to our pilgrimages? Why is He gathering us together from all sorts of backgrounds and traditions and from all the foreign countries, if it is not His intention, His plan, to put in us a renewed spirit and a renewed heart: to become the visible example, the visible sign of the ‘Unity in diversity,’ the way He wants it? Are we perhaps, without realizing it, the first Apostles, the Apostles of the End of Times, to have had a foretaste of the real and completed Unity? Christ never ceases to keep renewing the hearts of stone, changing them into hearts of flesh. Christ, in our times, is renewing the rigid hearts that were filled with prejudices that were stiff like the three unbending iron rods, the hearts that brought the division in the Church and who keep it… Oh yes! God can mold these hearts… After all, is God not known to be a God of Mercy and of power but of surprises as well? 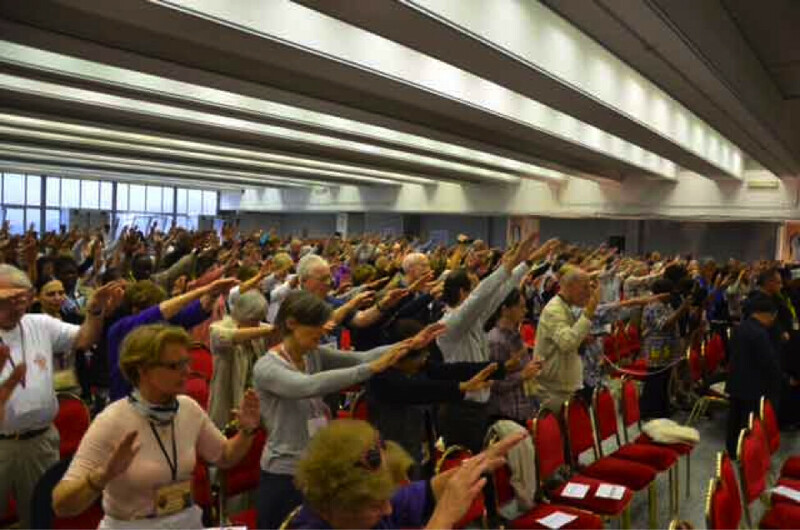 As was done in previous pilgrimages, the first day’s program activity in Rome, right after breakfast, was the recitation of the ‘Our Father’ prayer sung in the Aramaic language. Then came the preparation for the procession of the hundred and four clergy that represented fifteen different Church denominations that had to walk in a procession, escorted by the organizers, Anne-Marie Peters and Theodora Konidari together with Vassula. 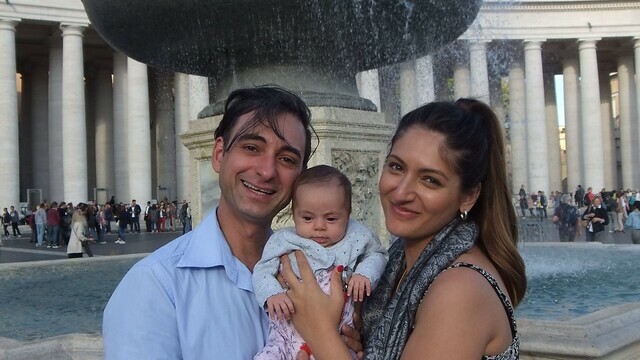 Unfortunately David Armitage, another organizer, was not well and did not go to Rome. All of the clergy were dressed in full splendour and in diversity representing their own Church; it is a formidable sight to see how the Church of Christ can appear when all the shepherds are dressed in all their regalia, in all their splendour and in their diversity. One can compare the Church to a beautiful garden with all sorts of flowers, a rich variety of flowers. Everyone watching could not deny being touched while they watched, and here I would emphasize: to watch ‘The One and Unique Church, the One Mystical Body’, solemnly walking together in silence through the aisle as one body with a background tune of Kyrié Eleisson. When the clergy reached the podium, each one of them in turn introduced himself and the church to which he belonged, while a great thunder of applause was heard with cheers. When it came to Mgr. René Laurentin’s turn to introduce himself, there was a sudden louder uproar of acclamation, thundering the assembly hall with cheers, with a standing ovation for him. Mgr. Laurentin could hardly finish introducing himself. It was not only because Mgr. Laurentin was the eldest of all the pilgrims, just over 98 years of age, totally blind and barely walking, but also because he has been heroically defending the Messages of True Life in God. He was (and is still) a staunch defender of Vassula’s apostolic mission. He has never missed any of our Pilgrimages, not one. When everybody again was seated, Vassula read out to us the so awaited Message of Christ and what He had to tell us in this significant gathering. And as I said above, it was again a clear and decisive Message that Christ was once again inviting his shepherds to reconcile and unite by showing a visible sign of Unity around one Altar. After hearing Christ’s message, there was a slight pause among all, so as to reflect on the Message, and then the first speaker was called to give his speech. 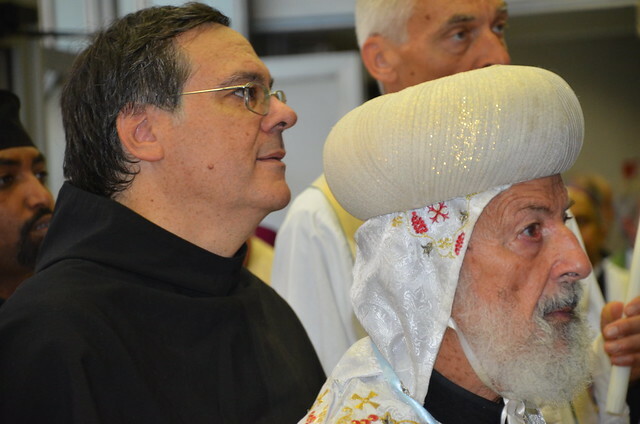 It was not the first time that Archbishop Georges Haddad was at our pilgrimages. He belongs to the Melkite Church, living in Lebanon. He had in the past invited Vassula to give a talk to his congregation in Lebanon. His speech was based on the words of the Heavenly Father saying that God has a special plan for each one of us and that we can only know Him through the Holy Spirit and the Truth. In fact, this is what Jesus has been asking us in the Messages of True Life in God: “come and get to know Me and understand Me…” and that He would be greatly disappointed were we to die without having known Him… He continued by saying that Salvation is the Door which opens into the Heavenly Father through Jesus and that the Holy Spirit makes the Unity of the Church, through the diversity of people, their culture, their personalities and their countries. He concluded his speech with a prayer of repentance that we all prayed together. 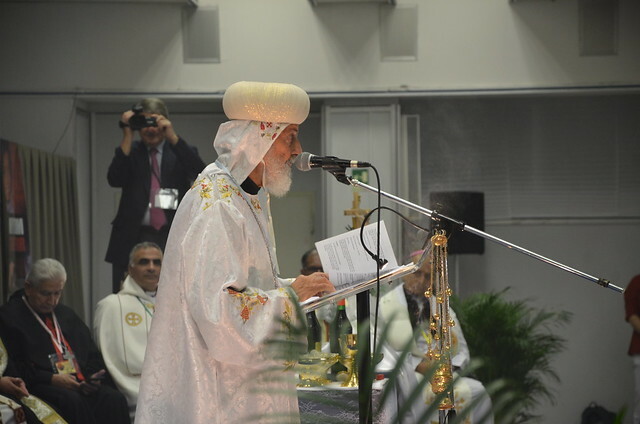 After that speech, his Excellency Bishop Athanasios Canepa, Bishop of all France, from the French Coptic Orthodox Church prepared Himself to celebrate the Holy Coptic Liturgy as programmed. 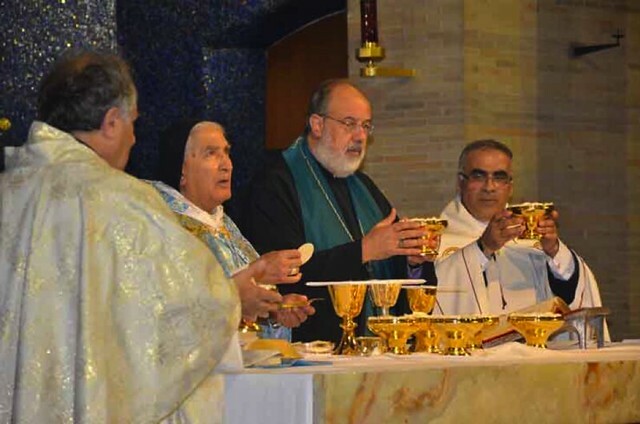 It was the first time that a Coptic Bishop was inviting all of us to his Mass. It was also the first time that Bishop Athanasios joined our pilgrimages and he was delighted to be with us to contribute in our efforts towards Unity. He told Vassula, not long ago, that the Messages of Christ had touched him enormously; that he had read a good part of them and that he believes what Jesus asks from His shepherds. Having been so touched by the Spirit, he wanted to contribute through whatever means he could so as to progress the Unity that Christ was calling His Church to achieve. We thank God for giving us warriors of faith. This calling was also in the Message that Christ gave to us in Rome for the pilgrims. Christ was asking us to become warriors of faith; not to fear, but to walk forward into uniting. In other words, Christ is reminding us in this End of Times that we are indeed in a spiritual battle, that we would face harsh opposition and persecution, but that we must remain in Him and be strong and fearless when these persecutions come our way. After the speeches, there was not one moment to lose. The buses were waiting to drive all the pilgrims to visit the Santa Scala, the Holy Stairs on which Jesus climbed to reach His trial by Pontius Pilate. Pilgrims from all over the world climb each step on their knees in prayer. The holy staircase is covered by wood and people could see only parts of the original ones through small glass slits that seemed to be out of marble. As the Basilica di Santa Croce in Gerusalemme was not far, the pilgrims walked over to that Basilica. This Basilica was built into part of the Imperial Palace of the Empress St. Helen. We had time to walk to the Chapel of the Holy relics, where we saw in awe a good part of the Good thief’s cross, the bone of the index finger said to be the incorruptible finger of St. Thomas, the finger as we know that he placed in the side wound of the Risen Christ, two thorns from the Crown of Thorns, three fragments from the True Cross and one nail used in the Crucifixion. Also on display was the ‘Titulus Crucis’, the inscription attached to the top of the True Cross. We were blessed to see with our own eyes some of the authentic instruments of the Passion of Christ. 12th October - Monday. We started our second blessed day with an early wake-up call, due to the long trip to Pompeii. 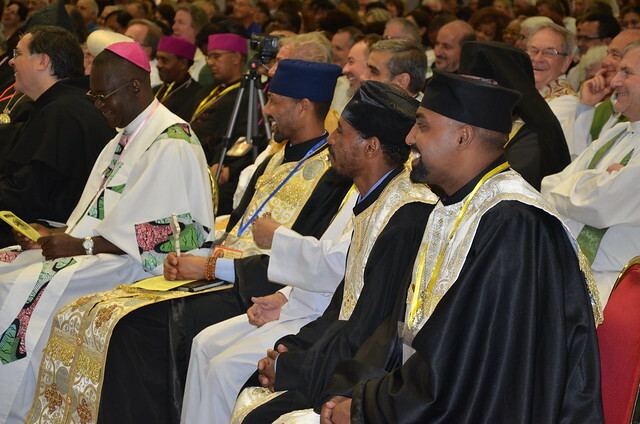 The organizers had reserved the sanctuary della Beata Vergine del Santo Rosario in which an Ethiopian Mass was programmed to be celebrated by his Excellency, Bishop Lesanu-Christos Matheos and the homily to be presented by Bishop Markos Gebremedhin Woldesenbet. After Mass we would be visiting the famous archaeological city of Pompeii. The history of the Sanctuary is told around that of a man, Bartolo Longo (1841-1926). Visiting Pompeii one day while he was in despair, a voice told him, "If you seek salvation, spread the Rosary. It is the promise of Mary: Whoever spreads the Rosary will experience salvation.” He moved an icon of Our Lady of the Rosary into the old church; soon the site produced miracles for those who came to pray there. Four years later, Bartolo Longo decided to focus on the greatest work of his life: building a shrine in Pompeii that is dedicated to the Virgin Mary. The sanctuary was built from 1876 to 1891, which also included a school, a workshop, an orphanage and a community center. After the manifestation of these miracles, Pope Leo XIII formally encouraged devotion to Our Lady of Pompeii. The sanctuary was erected in the papal basilica. On October 19, 2008, Pope Benedict XVI placed a golden rose onto the sanctuary, the highest distinction reserved by the Catholic Church for a Marian shrine. The miraculous icon of Our Lady of the Rosary is installed above the main altar, in a gilt frame. It represents the Holy Mother of God sitting on a throne with baby Jesus on her lap, a rosary which tends to St. Dominic, while His Holy Mother holds a rosary to St. Catherine of Siena. 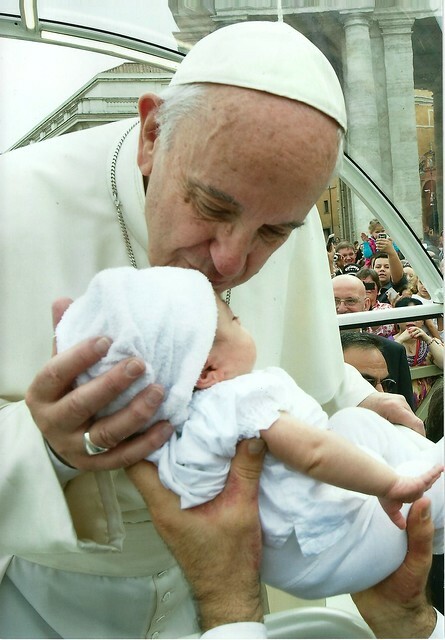 Pope Leo XIII said: "God has used this image to grant favors that moved the world". 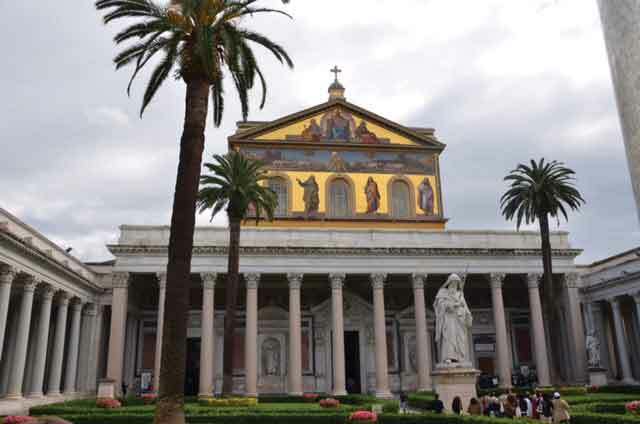 We were also all very surprised to discover that in Naples, which is near Pompei, we had a TLIG prayer group in existence for years, guided by Fr. Rolando Palazzeschi. When the Naples TLIG group heard that Vassula with the pilgrims were coming to the sanctuary, excitedly they all went to greet her. As Vassula was approaching the sanctuary, she was asked to hurry up her step and meet Fr. Rolando whom she had never met before. They ushered her to him. Vassula was very surprised that someone knew her in Naples and was even more surprised when she discovered we had a TLIG prayer group over there. Fr. Rolando exhilarated with joy embraced Vassula lovingly, inviting her to return to Naples next spring to give a talk on the Messages. Vassula was very happy because as she once told me, ‘Italy has been demolished by our persecutors; it is in a dormant state and needs to be awakened.’ Fr. Rolando subsequently accompanied her, so as to sit among all our clergy. Just before Mass began, the Archbishop Tommasco Caputo, who is the prelate of Pompeii and Pontificate delegate to the sanctuary, welcomed all of us. The Mass ended after we all sang in unison the Salve Regina to honor Our Lady. Our next step was to visit Pompeii. Archbishop Tommasco Caputo, prelate of Pompeii and Pontificate delegate to the sanctuary, welcomes Vassula and TLIG Pilgrims. Pompeii is famous because of Mount Vesuvius, which is best known for its eruption in AD 79 that led to the burying and destruction of the Roman cities of Pompeii, Herculaneum and several other settlements. That eruption ejected a cloud of stones, ash and fumes to a height of 33 km, spewing molten rock and pulverized pumice at the rate of 1.5 million tons per second, ultimately releasing a hundred thousand times the thermal energy released by the Hiroshima bombing. An estimated 16,000 people died due to hydrothermal pyroclastic flows. The only surviving eyewitness account of the event consists of two letters by Pliny the Younger to the historian Tacitus. The most recent eruption surfaced from 1913-1944. 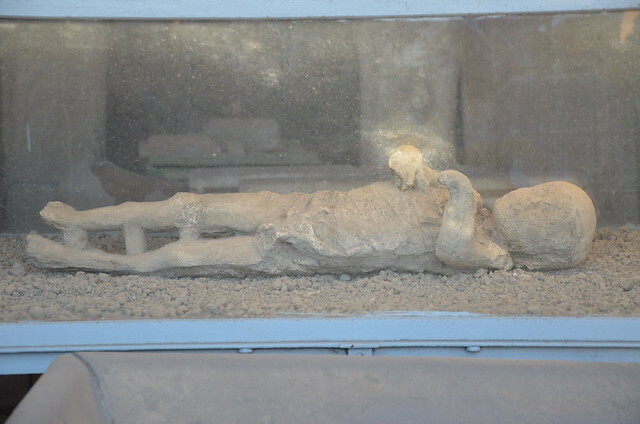 This is a plaster-encased body of a child who was buried by the ashes during the 79 AD eruption of the Vesuvius volcano. At the end of this wonderful day, we headed back to Rome. Another six-hour trip back was waiting for us, but it was totally worth it. 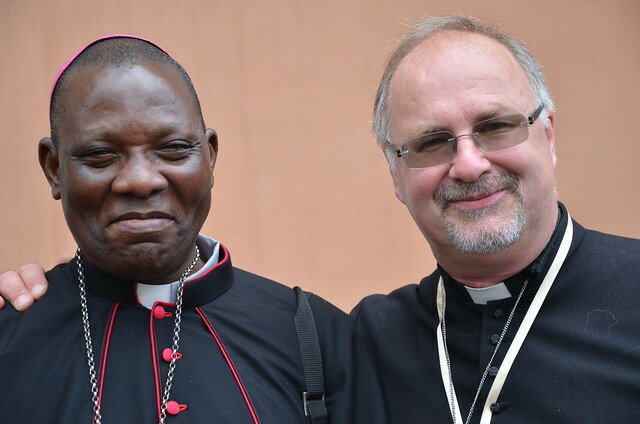 When we arrived at the hotel, exhausted but in high spirits, we rushed to the conference hall immediately to listen to the Nigerian Bishop, Oliver Dashe Doeme who was asked to give us a talk about his experience with Jesus . He told us that Islamists had burned down 32 Churches, killing many Christians. Boko Haram specifically targets Christians and Churches, educational institutions, “Western-style” government or security bodies, and Muslims who do not share its severe interpretation of sharia law. Bishop Oliver overwhelmed with this difficult situation in his country, went in his Church one day to pray and ask our Blessed Mother and Jesus to do something for his country that has, in addition to the extremist forces, much corruption; he asked Jesus to stop all of these killings. As he was in deep prayer, Jesus unexpectedly manifested Himself to Him carrying a long sword in both of His hands. Deeply moved and shocked at the same time, Bishop Oliver saw Jesus approaching him while fear started to grip him, wondering why was Jesus going over to him with a sword. Then as Jesus reached him, he passed the sword to him. As soon as he took the sword from Jesus, in his hands it turned into a Rosary! Jesus said to him: “Boko Haram is gone! Boko Haram is gone! Boko Haram is gone!” Three times! Yes, indeed, we heard one more story about the power the Rosary has against the evil powers. He concluded with the great news that there is now a new government after the last election this year, which is very serious about fighting corruption. This, he said was a miracle! Bishop Oliver said that he and the members of his church began to construct a shrine in honour of our Lady, but it went slow because of lack of funds. We, the True Life in God family, decided to make a collection for this project and offer it to him to continue building the shrine. This donation is also as a token of our love for the protection that both Jesus and Mary are giving to his country. He went on to tell us that the church members partake in all sorts of spiritual activities, such as daily morning Adoration. He is trying to encourage families to live their lives with fasting and prayer. His testimony was powerful and uplifting because once again, we realized how close to us Jesus is; He is aware of the struggles, the persecutions and the misery the Christians are undergoing right now. In the Messages of TLIG, Jesus is calling for prayer, an unceasing prayer, asking everyone to learn to pray the Rosary, for it is through the Rosary that the devil can be subdued and chained. Right after that wonderful testimony, Bishop Toppo was invited by Vassula to deliver his speech. He talked powerfully about his experience of Unity. In Ranchi a city south and near Calcutta, where he lives, he often meets up with many groups from other religions such as Muslims and Hindus. He tells them that there is only One God and we are all His children. He continued saying that yes, there are differences among us such as social backgrounds, religious backgrounds, economic backgrounds. The most important aspect of our diversity is to accept one another. When he meets up with 15 different Christian denominations, such as at this Pilgrimage, he delivers a very simple Message: We are under One God, One Jesus, One Holy Spirit, One Baptism! 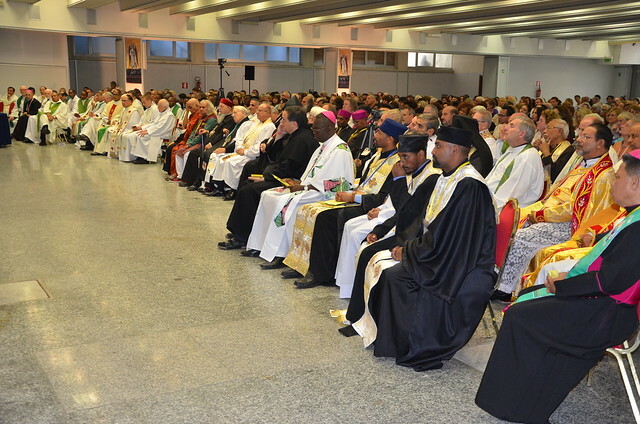 He said that he invites to his diocese all pastors, priests, leaders of other groups and talks to them about Unity. Furthermore, during Easter Monday they all gather together to celebrate the Risen Christ, and they do sing together and pray the Rosary together. He concluded by saying: Jesus is The Lord, The only One! Amen. Tuesday As every morning, we started our day by praying the “Our Father” in Aramaic in the assembly hall. The speaker that morning was Archbishop Kissag Mouradian from the Armenian Orthodox Church in Buenos Aires. He is a close friend to Pope Francis, as they both knew each other in Buenos Aires. He too delivered a speech about Unity. He stated that we are not perhaps fully aware of how big a work we are doing in being together and how important it is to live in Unity with others. He compared our differences with musical notes. Music is the same for all, but people play different musical notes, since we belong to different Churches – however, it is necessary to find the same musical notes to play for Our Lord’s Glory. This message was intended to remind us that in some countries, even though various religions exist, there could be peace and a life of harmony between them. Right after the presentation of this letter, the Syrian Catholic Archibishop, Gregorios Elias Tabe, gave a speech about the division of Christian denominations and of what comprised their early start in the first centuries. He said that he also comes from a divided denomination. He continued saying that with every difficulty we have in life we should seek always reconciliation immediately because the Lord wants it. Moreover, in his view, he believes that if Unity has not come yet, it is because the Church is not paying enough attention to the division or the differences among different groups, different languages, and different personalities. He concluded by saying that the Church has to focus more on this. Four years ago, our pilgrims visited Assisi where we had a wonderful and unforgettable Maronite Mass in Aramaic by Fr. Nabil Mouannes. In our program this year, 2015, we scheduled ourselves again to visit Assisi, the City of Peace as Saint John Paul II had named it. Our ride to Assisi, while on the youth bus, which I was in, and which transported all the youth, (some youth also of over 50 years of age, ahem…) the Rosary was prayed in five different languages. Upon arrival, we visited the upper Basilica of St. Francis, one of Italy’s foremost monuments, which was built between 1228 and 1253 AD. St. Francis was a mystic who experienced visions of Christ and Mary. In 1210, he founded the famous order of mendicant friars called the Franciscans. St. Francis was also the first known Christian to receive the stigmata. After spending some time in silent prayer, we went over to Santa Maria degli Angeli where we would have Mass. 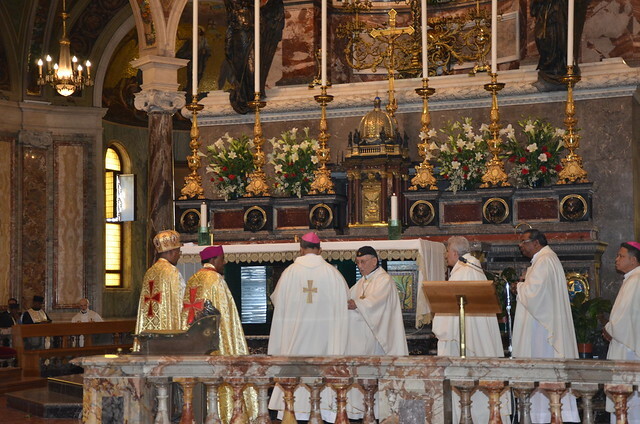 His Grace Archbishop Vincent Concessao was the celebrant. Within the walls of this glorious Church, in its centre, one finds the small Church called Porziuncola Chapel that was restored by Saint Francis after being abandoned for a long time. When Jesus asked him to restore and build His Church that is in ruin, Saint Francis understood that Christ was referring to this little Church that was in ruins. Finally, it was at that spot, at that little church, where Saint Francis finally understood his vocation clearly. He then established the Order of the Friars Minor (1209). On 28th March 1211, Claire, daughter of Favarone di Offreduccio, received her religious habit at that same place from the hands of Saint Francis and so she initiated the Order of the Poor Claires. Leaving behind us this lovely experience from the City of Peace, we headed back to Rome. 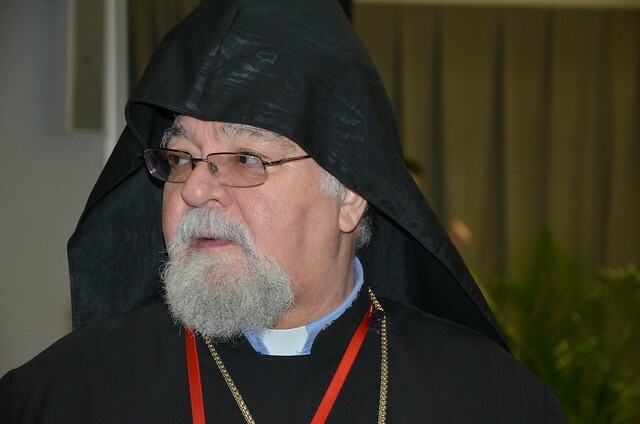 To everyone’s surprise, Vassula had a surprise visit from Cardinal Basilios Cleemis who was in Rome at the same time, attending the Synod of the Family in Rome, and staying at Santa Martha’s residence where Pope Francis resides. He came to meet Vassula and dine with her to discuss plans for a future Symposium/Pilgrimage with all the Churches of India. His Eminence comes from the Syro-Malankara Catholic Church. He knew Vassula, as she had met him during her former visits in India; he had heard a lot about her and her mystical experiences with our Lord Jesus Christ. The evening finished with Holy Adoration, led by Fr. Stephen Rafael. Wednesday was a very important day for all the pilgrims. We got up quite early; so as to leave early enough to go to St. Peter’s square and be a part of the general Papal Audience. At this point, it is good to re-state that the pilgrimage coincided with the Synod of the Family. Everybody was looking forward to this event. Many groups from all around the globe were gathered here to see and listen to Pope Francis. 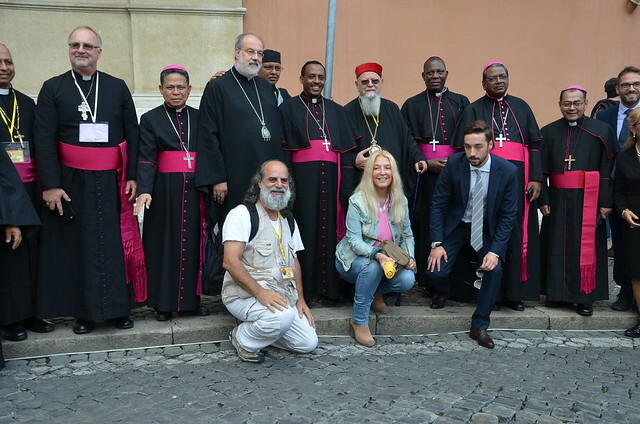 This was the second time that our TLIG group was not announced while in attendance for the Papal audience, although we were over 700 pilgrims; smaller groups of eight or ten people were announced. God knows who blocked out our name… but we continue to pray that our Lord opens the eyes of those who refuse to see. We had not lost courage; instead while there, we started singing Doksa, Doksa, holding our banner high. On our banner was written that the dates of Easter should be one. Finally, to our surprise, something else, quite wonderful happened. All of our clergy who were Archbishops and Bishops from the 15 Church denominations were allowed to sit very near the Pope. This was really a gift from above. Eventually, Pope Francis greeted them one by one, and all of them, without exception, and without coordinating a prepared remark said to the Pope that they were with 700 pilgrims of True Life in God and Vassula, that were gathered together to pray and work for Unity. The Pope then declared happily to one of them, “but I know Vassula!” The Pope seemed delighted. 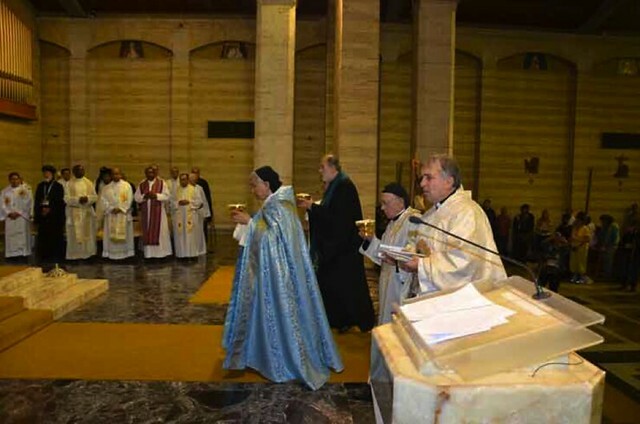 Archbishop Attallah from the Maronite Church said to the Pope daringly: “You must meet Vassula,” to which the Pope responded: “pray for me…” Pope Francis asked from almost all our clergy to pray for him. While we were all at the Papal audience, Vassula together with Fr. Vincent Cosatti and Mgr. 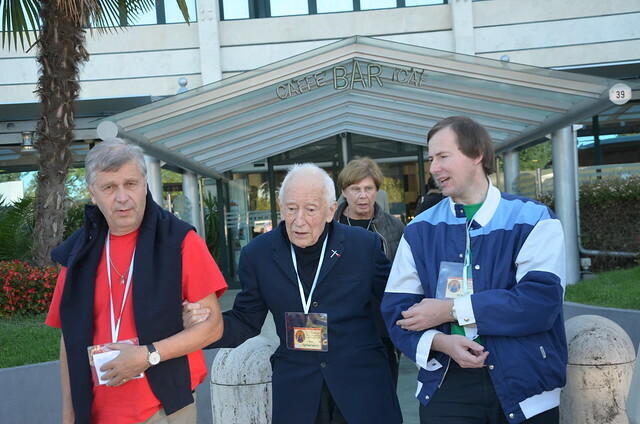 René Laurentin drove over to meet the great and renowned exorcist Fr. Gabriel Amorth who is now 92 years old. He said to them that he still does exorcism with the cases he had, but does not take new cases. Mgr. Laurentin and Fr. Amorth are great friends and have known each other for some time. Fr. Amorth has also known Vassula for years, since the time she was living in Rome. She had gone over to visit him and greet him while he was guiding a Medjugorje group in prayer. He announced to his group that Vassula was among them, and asked them to pray without ceasing as our Lord had instructed Vassula. When the Papal audience event ended, all of our Archbishops and Bishops who were gathered near the CDF Office were still discussing with excitement what they had said to the Pope, and what he had replied. Vassula, who had just returned from the meeting with Fr. Amorth, coincidently saw all of them standing in the street near the Papal audience area, discussing happily. When they saw Vassula, they called her over; each one of them told her what they said to the Pope and what his response was to them. This exchange with the Pope somehow amended the fact in indicating as to why the Pope was not given our name, so as to greet our group. Pope Francis that same day asked for forgiveness for the latest scandals in the Church. These were his words: “Before starting today's catechesis, on behalf of the Church, I want to ask for forgiveness for the scandals of the Church, in recent times, be it in Rome or in the Vatican. I ask for forgiveness.” Among those present at St. Peter’s Square were the 33 Chilean miners who were trapped underground for 70 days at the Copiapo mines in 2010. “I believe that any one of you is capable of coming up here and telling us what hope means. Thank you for hoping in God,” the Pope told them. He continued: “Love is the promise that man and woman make to each child: from the moment he or she is conceived in thought. Children come into the world and expect to have confirmation of this promise: they expect it in a total, confident, vulnerable way”. After enjoying some free time inside the Vatican area, we all went to celebrate the Maronite Mass by His Excellency Bishop Simon Attallah from Lebanon at the Church of Our Lady of Guadalupe Church, located close to our hotel. 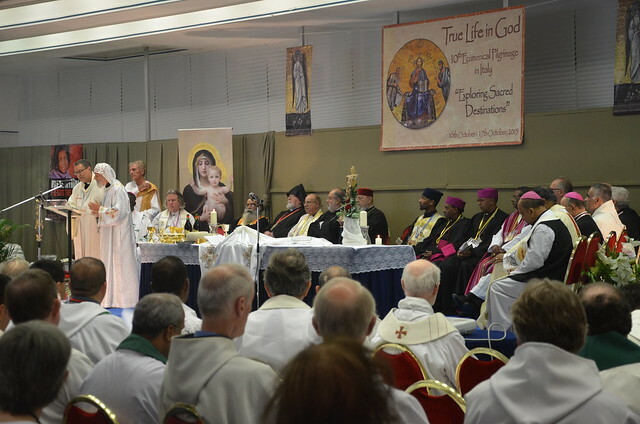 Father Nabil Mouanes’ words in the homely were filled with the Holy Spirit, as he was thanking Jesus for gathering all the clergy from so many nations together. He thanked Our Mother Mary of Guadalupe for gathering us together to celebrate the Maronite Rite and be one. 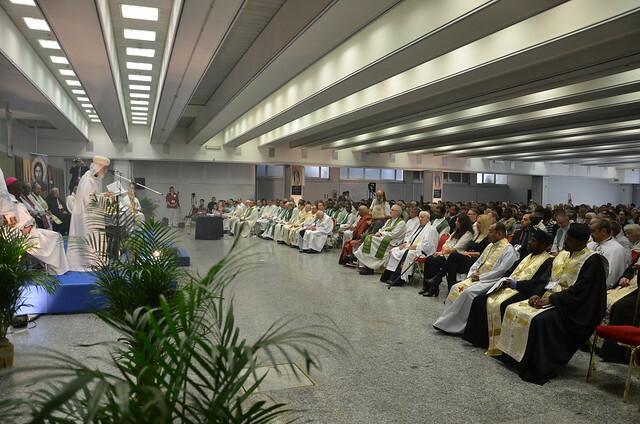 He continued by thanking Our Lord for the messages of True Life in God and for the Pope who stands at the right direction, summoning the Churches for a common date for Easter. The Mass ended with the singing of Ave Maria guided by Monsignor Elie Zouein. We gave thanks to Our Lord by singing the Our Father in Aramaic. After the prayer, Bishop Simon Attallah thanked Jesus for being with us at this pilgrimage. Here is His Excellency with Bishop Simon Attallah, with Archbishop Georges Al Haddad, Fr. Nabil Mouannes and Fr. Emile Abou Mrad. While walking out of the Church, some of our group still in high spirits continued singing the Doxa-Doxa and the passersby whether they were walking, driving a car or sitting on a bus were stopping by to take pictures and videos of our group. 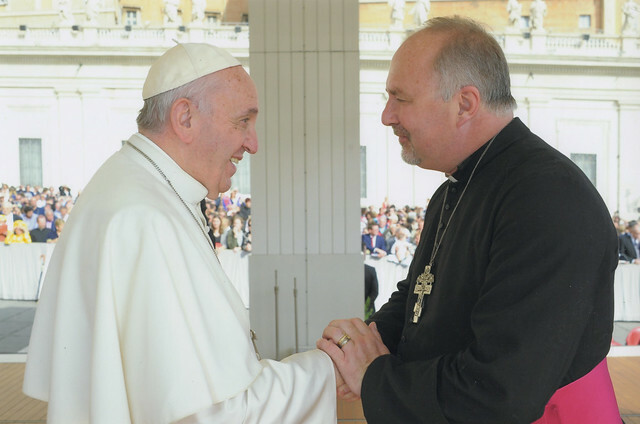 Later on that afternoon, in the assembly hall, many of the pilgrims wanted to know what the clergy who had spoken to Pope Francis said to him, and what the Pope had subsequently replied. So, they were asked to give their witness. The pilgrims were exhilarated with joy and consoled, for this was indeed a small triumph. That evening we heard a talk by Pastor Monels from the Evangelical Church, who kindly accepted our invitation to speak to us briefly about unity and the importance of it, especially in our times. Christians must understand that division does them no good. Our program finally ended with the Healing Service. As usual, all of the clergy was asked to be at the front of the room, while the ushers escorted the pilgrims who wanted to be prayed over, row by row. Many of us received a powerful blessing, ending thus this historical day. The fifth day was started with the singing of the Our Father in Aramaic. Our program was short that morning due to the long trip scheduled for Loreto, to the Sanctuary of The Holy House of Nazareth. This was something worth seeing. Immediately after those speeches we rushed off to our buses to go to Loreto. The Holy House of Nazareth is the house where the Virgin Mary was born and where she received the Annunciation. Around this house, venerated since the early days of Christianity and whose followers had never lost his memory, Saint Helena, mother of Constantine the emperor, had, in the 4th century, erected a Church. After the fall of the Holy Land under the rule of Islam in 1263, the Holy House was, according to tradition, transported on May 10, 1291 to Trsat (Rijeka, Croatia), where a vision that was revealed at the Church of St George, to Father Alexandre Georgević indicated that this was the house of Mary. To confirm this vision, Heaven cured a longstanding illness that he had. Three years later, in 1294, the Holy House was transported to Recanati, Italy, where it was rebuilt in 1295 within a laurel field (lauretanum), hence the name of Loreto. Archaeological evidence, namely the stones of limestone, which come from the Nazareth area, and the cedar wood, which does not exist in the Loreto region, as well as documents found in 1962, show that the house indeed comes from Nazareth. The Virgin of Loreto is the Patron Saint of migrants, pregnant women and drivers. The drive to Loreto from Rome was long, but we enjoyed it, as the scenic view was awesome. His Grace Archbishop Anil Couto from India was the celebrant of the Holy Catholic Mass in Loreto. Pilgrims from other groups and even individuals joined the Mass. It was a historical moment of Truth and Unity. 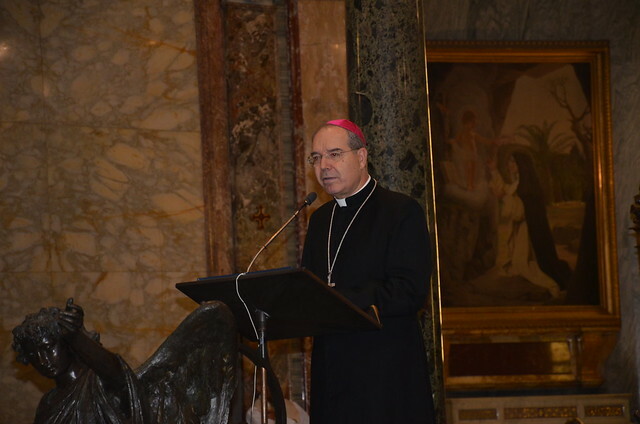 Archbishop Anil Couto spoke about forgiveness. We can ask Our Lord to erase our deviations, our sins, because a life close to God is a Life of Holiness. In this spirit of love and peace, he asked us to pray that Our Blessed Mother will lead us to the Unity of the Church. Our brothers and sisters from Congo enriched the Mass by singing wonderful Congolese hymns. After this lovely ceremony, we got onto our buses and started our return journey to Rome. This was the last day of our blessed pilgrimage. As we usually do, we started our program by singing Our Lord’s prayer in Aramaic and His Grace Bishop Felix Toppo celebrated Catholic Mass at the assembly hall of the hotel. Father Shaun Von Lillienfeld from South Africa was asked to say the homily. He is indeed a priest full of wit! Jesus, he said, is not like a supermarket where we take what we want and leave behind the stuff we don’t need. He added that His Word is not just written, it is active in healing all of us in any part of our lives. The previous thoughts in his homily were transmitted to us by him in a humorous way, thus uplifting us, offering reels of laughter many times over. “I would like for us to reflect for a moment on what the Lord said to Vassula: “My Spirit keeps you secure,” - but He also tells this to us – “putting both the will and the action in you to gather My shepherds”. Because for Jesus it is so important to gather His shepherds; because the biggest work that the Devil is doing is hurting the shepherds and dispersing the sheep. We are living in times of great confusion and lots of division. This is why it is of the utmost importance to open our hearts to this Word, (of Jesus). Yesterday, I was asking my brothers, have we asked for Mercy in this Pilgrimage? Jesus said (in His Message) “to pray for Mercy, for healing your division among yourselves, bringing peace to the world and Unity among all Christians;” Christ said this solemnly. Have we taken him seriously? This is my biggest concern. Further in the Message, Jesus says: “so I ask you truly: are you not consecrated to Me by your common baptism?” Is there only one Baptism? Then why can we not have one common Communion? Is Christ divided? Do I belong to Paul? Do I belong to Peter? One God-one Communion. Jesus says: “I am willing to give you the gift of Unity”. Jesus wants this! “to lift My Church as a sign for every nation to see My Glory”. Hallelujah! Hallelujah! Jesus is willing to do this, but we have to pray for Mercy. At the end, I will invite you to pray for Mercy. Can I confess my sins to an Orthodox priest? Is this Sacrament valid? Jesus says: “share your sacraments, My Sacraments.” for He is the Supreme Pontiff. The Church does not belong to the Pope, or to the Bishop, or to the priest. It belongs to Jesus Christ, the Supreme Pontiff. Later on, we departed for Saint Paul Outside the Walls (S. Paolo Fuori le Mura). It is in this Basilica that every year, on the feast of the Conversion of Saint Paul, January 25, the Week of Prayer for Christian Unity solemnly opens. The Pope has specified two privileged tasks for this Papal Basilica: the Sacrament of Reconciliation (or Penance) and the development and organization of ecumenical initiatives. After visiting Saint Paul’s cathedral outside the Walls, we were on our way to Saint Peter’s Basilica in the Vatican City. We passed by the Coliseum. The building was, and still is today, a show in itself. In fact, it is the largest amphitheatre not only in the city of Rome, but in the world, able to offer stunning sceneries as well as services for spectators. As a symbol of the pageantry of the Empire, over the centuries the Amphitheatre has changed its face and its function, offering itself as a structured space, which is also open to the Roman community. Today, the Coliseum is a monument unto itself and unto the works of human genius, which survive time. And yet, it is still comfortable and dynamic, accessible on two levels, offering a wide overview onto its interiors, but also short and evocative brief glimpses of the city from its outer arches. This last day was concluded with speeches given by clergy and testimonies from lay people at the conference room of the hotel. Father Bo Westergaard from the Swedish Lutheran Church spoke about Unity and reconciliation; if we are to follow our Lords command to love each other, we need to get to know each other, for the sake of Unity. He quoted a Message from TLIG that "every church has to die to its ego", but no Church needs to die to its soul. No Church will lose anything through Unity. What is authentic will remain. Moreover, Father John Abberton, who felt inspired by these words, came to the podium asking us to trust Our Lady because she brought us together. He added by saying that no religion has anything to lose from Unity. He concluded by saying that if people have worries and fears about the future, they need to admit them and continues the God given path. “The discrimination among people of various casts, creed or religion is the root of all obstacles of establishing unity around the globe. The Buddha had his loud voice of eliminating such differences of human kind. Today I recollect in memory how Vassula Ryden first started the journey of TLIG with the vow of unity and tranquillity among people of all denomination. After hearing the Venrable Sudhananda’s talk, lay people like Joe Chiaramonte from America who had seen Jesus’ Face on Vassula the first time he went to hear her, was invited to speak about his conversion. Joe said that The Holy Spirit guided him to find Jesus’ messages. Through the messages, he felt such a great Love and a Grace in his heart. He had never before felt such a love from his family and he moreover, felt so blessed to be among us. Another layperson Cecilia Lutz from the Philippines shared her conversion story. She found God and His messages when living in Switzerland, after being exposed to the New Age sect at that time. She discovered the Messages through her friend who had travelled from the Philippines to interview Vassula in Switzerland, as Vassula was living there at the time. Cecilia admitted that she doubted Vassula’s authenticity at first sight; Vassula did not have the figure of a person who receives messages from God. Cecilia expected to see someone who looked more like a nun, whereas Vassula’s appearance was more like a model’s. However, later on in her house, during the interview she experienced the powerful presence of The Lord. She said that she heard a voice telling her: “The King of kings is here.” She ended this beautiful testimony by saying that the Messages saved her marriage. And thus, these testimonies ended our Pilgrimage in the Eternal City.